Our culture has an understandable fascination with the dangerous creatures of the sea. We are, after all, living in a world that is water by the vast majority and we only have the privilege of seeing a fraction of the life within it. So, it isn’t any surprise that we have an entire week dedicated to one of the most formidable and misunderstood creatures in the sea: the shark. For an entire week, the whole populous goes shark crazy. Amazing documentaries teach us everything we never thought we’d know about the creatures. Meanwhile, we also have Sharknado… which… definitely exists! But, is a week enough? If we go that nuts for sharks over a single week, shouldn’t we want more? A shark month? Though, perhaps the creatures wouldn’t even want that much attention. They are loners, often. Shy swimmers that avoid too much contact, unless of course there looks to be something especially delectable or intriguing… then out comes the curiosity! Perhaps instead of extending the week, we should simply incorporate them more into some of our other choice holidays. 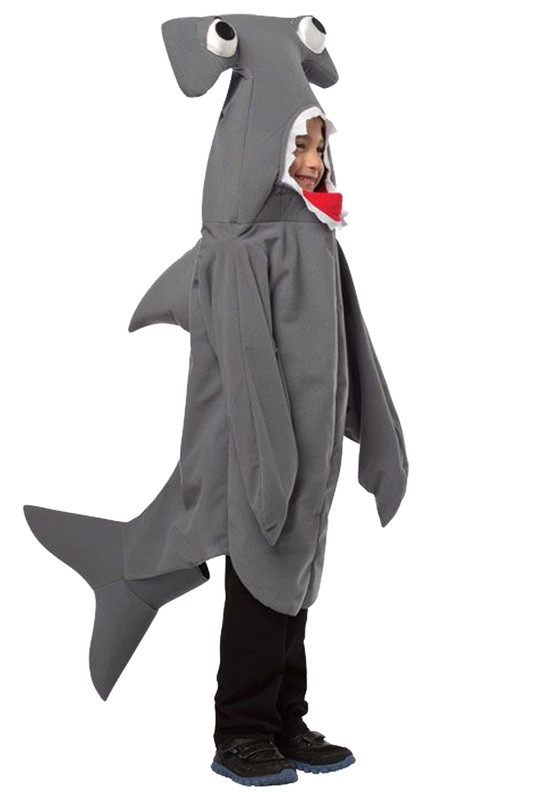 We can think of no better solution to this than to offer you the Child Hammerhead Shark costume for this Halloween. Your child can be a menace at the beach by donning this polyester brushed knit flannel pullover tunic. Its sewn-on fins, tail, and flat hammer head won’t exactly give your kiddo the swimming power of the shark, but will certainly gain the adorable fascination that so many of us have for the mysterious fish. The mouth of the shark costume is lined in teeth where your kiddo’s face will appear. We’re relatively sure that won’t instill the false idea that it is fun to get eaten by sharks, but you might need to watch a couple extra documentaries during the actual shark week, just in case.